Create your own custom candy bars for any fun event by simply choosing the colors, design and message to be used on our milk chocolate wrappers. 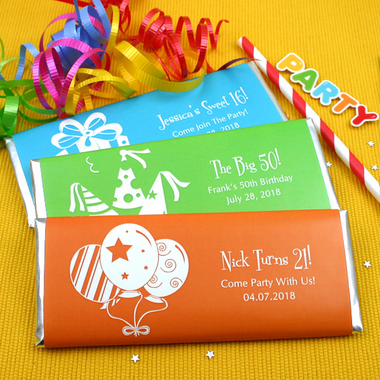 These delicious Hershey's milk chocolates will be extra sweet with your special personal touch, making it just the right party favor for your splendid celebration. Each fully wrapped Hershey®'s Milk Chocolate bar weighs 1.55 ounces. SHIPPING DURING WARM WEATHER REQUIRES A MAXIMUM OF TWO DAY SHIPPING AND AN ADDITIONAL COLD PACK AS NECESSARY. ALSO, WEST COAST ORDERS MAY REQUIRE ADDITIONAL SHIPPING COSTS. PLEASE MAKE SURE THAT THE PACKAGE IS RECEIVED BY SOMEONE OR PICKED UP PROMPTLY. WE CANNOT BE RESPONSIBLE FOR MELTED ITEMS.